Objective: To find new compounds in order to overcome the mainstay of metastatic breast cancer due to the adverse side effects from, and increasing resistance to, current chemotherapeutic agents. Methods: α-Mangostin and apigenin were reported in comparison to doxorubicin, a chemotherapeutic drug. Ductal carcinoma (BT474) cell line and non-tumorigenic epithelial tissue from mammary gland (MCF-10A) were used. Cell viability assessment was calculated by the standard 3-(4,5-dimethylthiazol-2-yl)-2,5-diphenyltetrazolium bromide method. Cell morphology was investigated by light microscopy. By flow cytometry analysis, programmed cell death was observed using annexin V and propidium iodide staining while cell-cycle arrest was observed using propidium iodide staining. Change in transcriptional expression was evaluated by real-time quantitative reverse transcription PCR. Results: In 3-(4,5-dimethylthiazol-2-yl)-2,5-diphenyltetrazolium bromide assay, the result revealed α-mangostin and apigenin were more cytotoxic to BT474 cells. Longer exposure times to α-mangostin and apigenin caused more floating cells and a lower density of adhered cells with more vacuoles present in the colonies in BT474 only. α-Mangostin and apigenin caused necrosis in BT474 cells in a 24 h exposure, but a small amount of early apoptotic cells could also be detected at 24, 48 and 72 h exposure, whereas doxorubicin caused early apoptosis to BT474 cells at 24 h. Transcript expression and activity analysis supported caspase-3 was involved in the death of BT474 cells treated by all compounds. Moreover, α-mangostin and apigenin arrested the cell-cycle at the G1-phase, but at the G2/M-phase by doxorubicin. All three compounds induced a change in transcript expression levels of inflammation-associated, proto-oncogene, autophagy-associated and apoptosis-associated genes. Conclusions: α-Mangostin and apigenin are worth investigating as potential new sources of chemotherapeutic agents for breast cancer treatment. Foundation project: This work was financially supported by Chulalongkorn University, the Doctoral Degree Chulalongkorn University 100th Year Birthday Anniversary, the 90th Anniversary of Chulalongkorn University Fund(Ratchadaphiseksomphot Endowment Fund), Sci-Super IV_61_003 and the Overseas Research Experience Scholarship for Graduate Student. Breast cancer has long been a severe problem. Although surgery, chemotherapy, and other therapies have been developed, adverse side effects including drug and multidrug resistance have been reported,,. Moreover, anti-cancer or chemopreventive agents can have different potentials against different molecular subtypes of breast cancer. For example, ent-11 α-hydroxy-15-oxo-kaur-16-en-19-oic-acid can induce apoptosis of MCF-7 and MDA MB-231 cancer cells differently. Sayeed et al. also reported that allyl isothiocyanate, found in many cruciferous vegetables, inhibited the proliferation of MCF7 depending on time and concentration. Also, it was very cytotoxic to MCF-10A. However, allyl isothiocyanate did not have an inhibitory effect against MDA MB-231 cells at all. It was reported that new cancer cells have been isolated and characterized, such as the KAIMRC1 cell line which has the fastest migration behavior. Moreover, it displays heterogeneity of genomic instability. It leads to the more complication in prevention and treatment. In addition, the healthcare costs of treatment are also key factors. Thus, searching for novel anti-cancer or chemopreventative agents to overcome resistance and subtype specific sensitivity as well as reduce the cost and side effects is necessary. Compounds from natural sources have received more attention as promising active compounds having less side effects in order to improve cancer treatment. For example, lignans were shown to have potential application against breast cancer due to their phytoestrogen activity. Furthermore, Ezzat et al. reported that flaxseed reduced breast carcinoma in female Swiss albino mice. In this work, the BT474 breast cancer cell line, which was derived from a ductal carcinoma, was used as a model breast cancer cell line. Normal mammary epithelial fibroblast (MCF-10A) cell line was used as a non-transformed control. α-Mangostin, a major compound extracted from Garcinia mangostana Linn. and from the cerumen of Tetragonula laeviceps, as well as apigenin, a major compound extracted from many fruits and vegetables and the bee pollen of Apis mellifera,,,, were screened. Doxorubicin, a currently used chemotherapeutic drug, was used as a positive control. 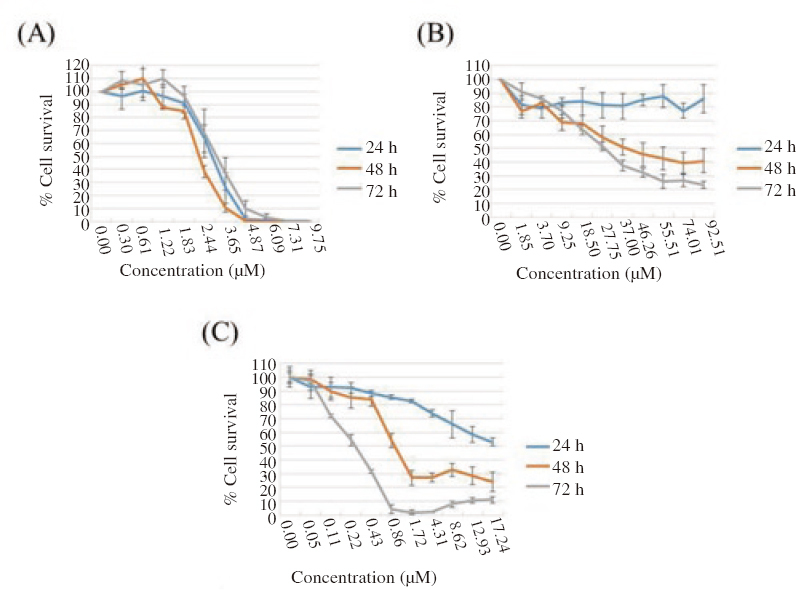 Cytotoxicity was evaluated by the inhibition concentration 50% (IC50). The change in morphology of treated cells was recorded under a light microscope. Programmed cell death and cell-cycle arrest were analyzed using flow cytometry and supported by evaluation of the enzyme activity of caspase-3, -8 and -9. The changes in transcript expression levels of cancer related genes were evaluated by real-time quantitative reverse transcription PCR (real-time qRT-PCR). Overall, the obtained data gives a broader insight into how α-mangostin and apigenin play a role on BT474 cells. Ductal carcinoma (BT474) cell line (ATCC no. HTB20) was cultured (passage 35-59) in CMR containing 10% (v/v) fetal calf serum. Non-tumorigenic epithelial tissue from mammary gland (MCF-10A) (ATCC No. CRL-10317) was cultured in CMD with 5% (v/v) horse serum, 20 ng/mL recombinant epidermal growth factor, 0.5 mg/mL hydrocortisone, 10 μg/mL insulin and 100 ng/mL cholera toxin. The 1×106 cells were cultured in 5 mL CMR in a 25-cm2 flask and incubated at 37 °C in a humidified 5% CO2 environment. For each cell line, 1×104 cells were cultured in 198 μL medium in each well of 96-well plates and incubated for 12 h. They were then treated with various concentrations of the respective test compound (α-mangostin, apigenin and doxorubicin which was used as the positive control for comparison) dissolved in 2 μL dimethylsulphoxide (DMSO). At 24, 48 and 72 hours of treatment, 5 μg 3-(4,5-dimethylthiazol-2-yl)-2,5-diphenyltetrazolium bromide (MTT) was added into each well. It was cultured for a further 3-4 h to allow formazan formation. After the medium removal, the formazan was solubilized by the addition of DMSO (150 μL). The absorbance value was measured at 560 nm (A560). The effect of test compound was presented as cell viability percentage relative to the control. The IC50 of each compound was obtained from the curve of the cell viability percentage (Y axis) and its concentrations (X axis). BT474 (1×106 cells) were cultured in 5 mL CMR in a 25 cm2 flask for 12 h. Then, they were treated with DMSO 0.1% (v/v) as control or with α-mangostin (9.75 μM), apigenin (37.01 μM) or doxorubicin (0.46 μM). At 24, 48 and 72 h, live cell images were captured under light microscopy using a Nikon Eclipse TS100 microscope coupled with DS-L3 imaging system. BT474 (1×106 cells) were cultured in 5 mL CMR in a 25 cm2 flask for 12 h. Then, they were treated with DMSO 0.1% (v/v) as control or with α-mangostin (9.75 μM), apigenin (37.01 μM) or doxorubicin (0.46 μM). At 24, 48 and 72 h, cells were then harvested by trypsinization, then washed with cold PBS, 2× and spun at 3 000 ×g, at 4 °C for 5 min. For apoptosis detection, the cell pellet was resuspended in 50 μL binding buffer and stained by 5 μL annexin V (catalog no. A13201, Thermo Fisher Scientific Inc., MA, USA) and 5 μL propidium iodide (PI). After incubation in the darkness for 30 min, the samples were analyzed using flow cytometry (Beckman Coulter, Brea, CA). The experiment was performed in triplicate. For the cell cycle analysis, the cell pellets were fixed with 200 μL cold 70% (v/v) ethanol at 4 °C for 12 h, spun at 3 000×g at 4 °C for 5 min and washed with cold PBS. The cell pellet was then resuspended in 250 μL PBS with 0.1 mg/mL RNase and incubated at 37 °C for 30 min. Afterwards it was washed as above and resuspended in PI staining buffer and incubated in the darkness for 30 min. The samples were then analyzed using flow cytometry (Beckman Coulter, Brea, CA). The experiment was performed in triplicate. BT474 (1×106 cells) were cultured in 5 mL CMR in a 25 cm2 flask for 12 h. Then, they were treated with DMSO [0.1% (v/v)] as control or with α-mangostin (9.75 μM), apigenin (37.01 μM) or doxorubicin (0.46 μM). The harvested cells were then subjected to the caspase-3, -8 and -9 colorimetric assay kits (catalog No. ab39401, ab39700 and ab65608, Abcam, UK) as described in the kit instructions. Finally, the absorbance at 400-405 nm was measured. The experiment was performed in triplicate. Changes in the transcriptional level of selected genes from four groups were investigated. The first group was inflammation-associated genes, from which Cox2 and NF κ B were representatives. The second group was proto-oncogenes, from which CTNNB1 was selected. The third group was autophagy-associated genes, with CathepsinB being a representative. The last group was apoptosis-associated genes, from which BCL2, CASP3, CASP7, CASP8 and CASP9 were selected. The transcriptional level was quantitated using real-time qRT-PCR. BT474 (1×106 cells) were cultured in 5 mL CMR in a 25 cm2 flask for 12 h. Then, they were treated with DMSO [0.1% (v/v)] as control or with α-mangostin (9.75 μM), apigenin (37.01 μM) or doxorubicin (0.46 μM). After harvesting, total RNA was extracted using an RNeasy mini kit (catalog No. 74104, Qiagen, CA, USA). The obtained RNA concentration and purity was evaluated by spectrophotometry at an absorbance of 260 nm and 280 nm. The real-time qRT-PCR was performed using a One Step SYBR® PrimeScript™ RT-PCR kit II (Perfect Real time; catalog No. RR086A, Takara, Japan) according to the manufacturer’s protocol. Specific forward and reverse primers were designed using Oligo 7.0 software [Table 1]. Table 1: Targeted genes and primer sequences. Amplification and quantification of the level of transcripts in each specific gene of interest was performed by the Minicon® system (Bio-rad, CA). Triplicate in each reaction was done. All target genes were normalized to that for the GADPH expression level in each sample. Mean ± standard deviation (SD) was shown for all data derived from three replications. Using one way analysis of variance (ANOVA) and Tukey’s test of multiple comparisons by the SPSS program version 19.0, the mean difference was significant at the P<0.05 and P<0.01 levels. BT474 cells treated with α-mangostin inhibited their proliferation depending on concentration. All three incubation times revealed the marked antiproliferation activity of α-mangostin, although α-mangostin at 48 h was slightly most effective for the same level of inhibition [Figure 1]A. Apigenin was inhibitory after 48 and 72 h, but not at 24 h [Figure 1]B, while doxorubicin was cytotoxic at all three time points but only weakly at 24 h [Figure 1]C. Therefore all three compounds were cytotoxic to cells depending on time and concentration. Derived IC50 of α-mangostin, apigenin and doxorubicin were summarized in [Table 2]. At all assayed time points, α-mangostin was more cytotoxic to BT474 cells than apigenin. At 24 h, BT474 cells were only sensitive to α-mangostin, whereas proliferation of BT474 cells inhibited by apigenin and doxorubicin occurred after longer exposures. Figure 1: Cytotoxicity of (A) α-mangostin, (B) apigenin and (C) doxorubicin on BT474 cells. The cell survival (%) was estimated by the MTT assay after 24, 48 and 72 h exposure (blue, orange and grey line, respectively). Data are shown as the mean±SD, derived from three independent repeats. Table 2: IC50 of α-mangostin, apigenin and doxorubicin against BT474 and MCF-10A cells. Since all three compounds were cytotoxic to BT474 cells, it was necessary to find out if these compounds were also cytotoxic to normal cells. In this study the MCF-10A normal breast cells were used as a representative control. From [Figure 2], it was of note that the inhibition manner of these three compounds on MCF-10A and BT474 cells was similar. In addition, apigenin was the least cytotoxic compound against MCF-10A cells, especially at the early time point (24 h exposure). The derived IC50 of these three compounds against MCF-10A cells were summarized in [Table 2]. Comparing the IC50 between BT474 and MCF-10A cells at each time point, both α-mangostin and apigenin were slightly more cytotoxic to BT474 than MCF-10A cells. Of note was that, doxorubicin was more cytotoxic to MCF-10A cells, especially at the early (24 h) exposure. 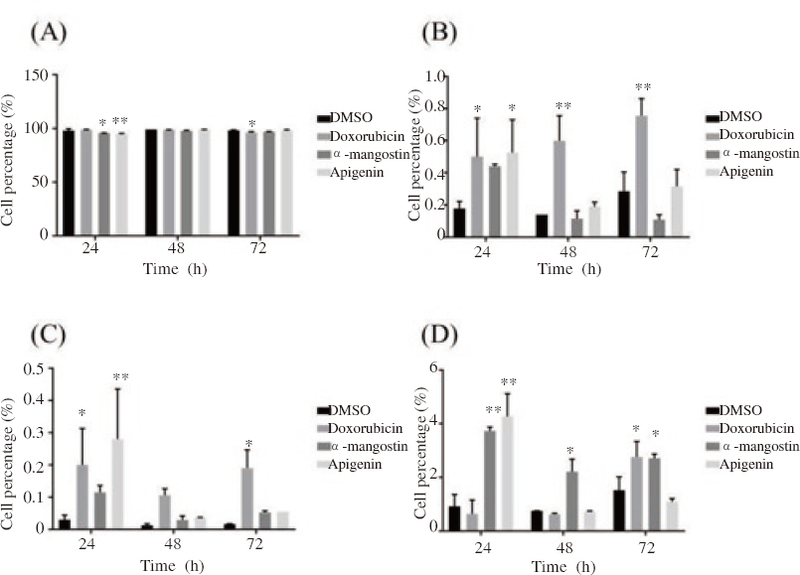 At a concentration as low as 1.72 μM, doxorubicin induced 100% MCF-10A cell mortality at 48 and 72 h [Figure 2]C.
Figure 2: Cytotoxicity of (A) α-mangostin, (B) apigenin and (C) doxorubicin on MCF-10A cells. The cell survival (%) was estimated from the MTT assay after 24, 48 and 72 h of treatment (blue, orange and grey line, respectively). Data are shown as the mean±SD, derived from three independent repeats. 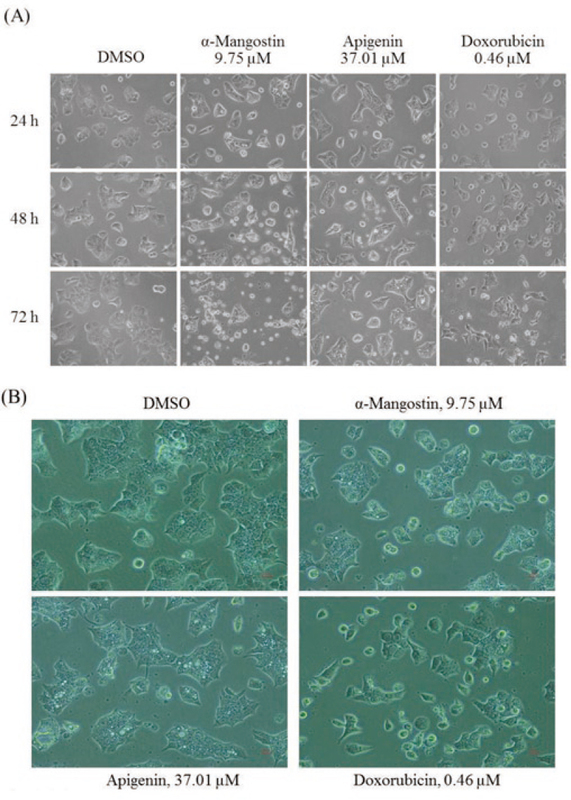 In order to observe the morphological changes in BT474 cells, α-mangostin, apigenin and doxorubicin at 9.75 μM, 37.01 μM and 0.46 μM, respectively, were chosen along with 0.1% DMSO. At 100× magnification, at all three time points (24, 48 and 72 h), strange morphologies of the cells treated by each compound were evident, but not in the DMSO control. The longer the treatment (exposure) time was, the more floating cells and lower density of attached cells were noted [Figure 3]A. At 200× magnification and 48 h time point, clear colony formation was evident in the control (DMSO-treated) cells, whereas the smallest colonies were observed in the doxorubicin-treated cells. Thus, doxorubicin may inhibit the proliferation of BT474 cells by inhibiting their migration/invasion [Figure 3]B. Although colonies were formed in the α-mangostin- and apigenin-treated BT474 cells, more vacuoles were evident within the cells [Figure 3]B. Overall, some indicators of potential apoptosis like cell blebbing and shrinkage, were also observed in treated cells by the three compounds, but not the control cells. 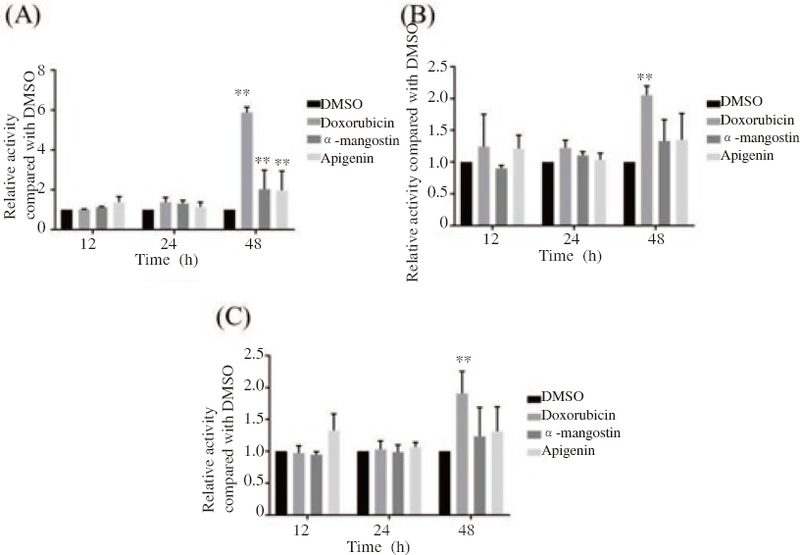 Figure 3: Morphology of BT474 cells treated with 0.1% (v/v) DMSO only (control), or DMSO containing α-mangostin (9.75 μM), apigenin (37.01 μM) and doxorubicin (0.46 μM) examined (A) after 24, 48 and 72 h at 100 × magnification and (B) the same treated BT474 cells examined after 48 h at 200 × magnification. Images shown are representative of those seen from at least three such fields of view per sample and three independent repeats. Considering [Table 2], although α-mangostin was cytotoxic to MCF-10A normal cells, the shape and density of the α-mangostin treated MCF-10A cells were similar to the control (DMSO only treated) cells at all three assayed time points [Figure 4]A and [Figure 4]B. After 72 h, α-mangostin-treated MCF-10A cells were still attached to the substratum [Figure 4]A. After 24 h, at any time no IC50 value was determined [> 92.51 (apigenin) and 17.24 (doxorubicin) μM] for apigenin- and doxorubicin-treated cells [Table 2], similar shaped cells to the control were seen, and were still noticed in samples with longer exposure times, except that a lower cell density was prevalent in the doxorubicin-treated cells [Figure 4]A and [Figure 4]B. Thus, BT474 breast cancer cells may have a greater sensitivity to these compounds than MCF-10A normal breast cells, potentially indicating that these three compounds may be practical chemotherapeutic agents. 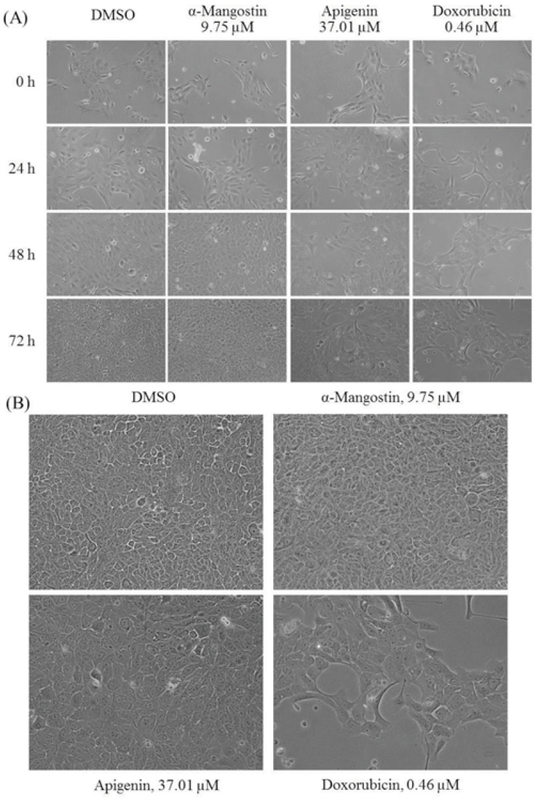 Figure 4: Morphology of MCF-10A cells treated with 0.1% (v/v) DMSO only (control), or DMSO containing α-mangostin (9.75 μM), apigenin (37.01 μM) and doxorubicin (0.46 μM) examined (A) after 24, 48 and 72 h at 100 × magnification and (B) the same treated MCF-10A cells examined after 48 h at 200 × magnification. From the observed changes in the BT474 cell morphology [Figure 3], especially the increasing amount of vacuoles in the treated cells, programmed cell death was possibly presented. Treated BT474 cells were stained using annexin V and PI, and flow cytometric analysis revealed that both α-mangostin (9.75 μM) and apigenin (37.01 μM) induced a significant level of necrosis to BT474 cells since early exposure time (24 h; P<0.01) onwards. However, apigenin induced a significant level of early (P<0.05) and late (P<0.01) apoptosis at 24 h exposure, while doxorubicin (0.46 μM) caused early apoptosis of BT474 cells at an early exposure time (24 h). Longer exposure times caused an increased amount of necrotic cells, although early apoptotic cells were still detected in the 48 and 72 h time points [Figure 5]. Figure 5: Flow cytometric analysis of BT474 cells stained with annexin-V and PI after treatment of cells with 0.1% (v/v) DMSO alone (control) or containing α-mangostin (9.75 μM), apigenin (37.01 μM) or doxorubicin (0.46 μM) for 24, 48 and 72 h.
The derived % positive cells for (A) cell viability, (B) early apoptosis, (C) late apoptosis and (D) necrosis. “*” and “**” represent a significant difference between the control and treated cells in each group at P<0.05 and P<0.01, respectively. From this flow cytometric analysis [Figure 5], apigenin and α-mangostin appeared to mainly induce necrosis in BT474 cells at 24 h, although some apoptotic cells could still be observed. To further evaluate the possibility of apoptosis, caspase-3, -8 and -9 activities were assayed from BT474 cells after exposure to these compounds for 12, 24 and 48 h. However, the significant increase in the relative caspase activity, compared to that in the control cells, was only detected at 48 h (P<0.01). The activity of caspase-3 was clearly increased by all three compounds, while the activity of caspase-8 and -9 was upregulated by doxorubicin [Figure 6]. Figure 6: Relative caspase activity in doxorubicin-, α-mangostin- and apigenin-treated BT474 cells. Cells were treated with 0.1% (v/v) DMSO alone (control) or containing α-mangostin (9.75 μM), apigenin (37.01 μM) or doxorubicin (0.46 μM) for 12, 24 and 48 h and then assayed for (A) caspase-3 (B) caspase-8 and (C) caspase-9 activity. Data are shown as the mean ± SD, derived from three replications, where “**” represents a significant difference between the control and treated cells at P<0.01. The possibility of cell-cycle arrest was analysed using flow cytometry of PI-stained BT474 cells after each treatment. Both α-mangostin (9.75 μM) and apigenin (37.01 μM) induced detectable levels of cell-cycle arrest at the G1-phase from 24 h exposure onwards, whilst doxorubicin (0.46 μM) arrested the cell-cycle at the S-phase in an early exposure (24 h), but at the G2/M-phase at 72 h [Figure 7]A and [Figure 7]B. Figure 7: Cell cycle arrest of BT474 cells after treatment with 0.1% (v/v) DMSO alone (control) or containing α-mangostin (9.75 μM), apigenin (37.01 μM) or doxorubicin (0.46 μM) for 24, 48 and 72 h.
(A) Flow cytometric histograms (5 000 events), representative of those seen from three replications, and (B) the derived mean % (± SD) of cells in the (a) G1, (b) S and (c) G2/M phase of the cell cycle. “*” and “**” represent a significant difference between the control and treated cells at P<0.05 and P<0.01, respectively. α-Mangostin and apigenin might affect the proliferation or death of BT474 cells were summarized in [Figure 8], where Cox2 was significantly up-regulated by both α-mangostin and apigenin (P<0.01), but not by doxorubiucin, while CathepsinB was significantly up-regulated by α-mangostin only, and BCL2 was not significantly altered by all three compounds. 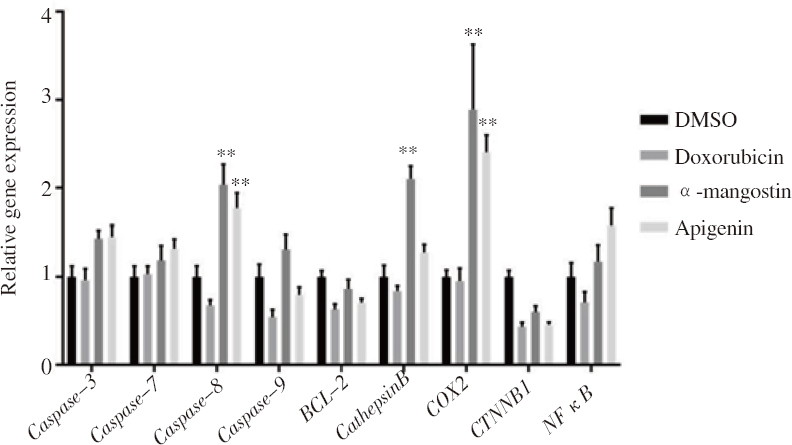 Figure 8: Change in transcript expression levels of selected inflammation-associated genes (Cox2 and NF κ B), proto-oncogene (CTNNBI), autophagy-associated gene (CathepsinB) and apoptosis-associated genes (BCL2, CASP3, CASP7, CASP8 and CASP9). BT474 cells were cultured with 0.1% (v/v) DMSO alone (control) or containing α-mangostin (9.75 μM), apigenin (37.01 μM) or doxorubicin (0.46 μM) for 24 h. Data are shown as the mean ± SD, derived from three independent repeats. Significant differences between the control and treated cells in each group are shown at the **P<0.01 level. Here, we report the in vitro potential of α-mangostin and apigenin on the growth of BT474 cells in direct comparison with the effect of doxorubicin, a currently used chemotherapeutic agent. These two compounds (α-mangostin and apigenin) were selected since flavonoid phenolic compounds have increasingly been reported to have potential beneficial roles against cancers. Cultured BT474 and MCF-10A cells were analyzed at 24 h (acute response), 48 h (mid-term response) and 72 h (late response). The proliferation and inflammation activities of α-mangostin and apigenin were investigated since inflammatory responses are involved with tumor development. Sano et al. reported a correlation between Cox2 transcript levels as an inflammatory marker and the survival of locally advanced oral squamous cell carcinoma. Furthermore, butyrate induced the expression of RUNX2 and COLIAI genes, which play important roles in the differentiation and anti-inflammatory mediators in SaOS-2 osteosarcoma cells. Increased expressions of Cox2 and NF κ B, which can lead the cells to apoptosis by regulating the anti-apoptotic genes, were screened as representatives, wheie NF κ B is linked between cancer and inflammation. In this study, in contrast to doxorubicin, both α-mangostin and apigenin increased the transcriptional level of Cox2 significantly, which indicates their potential for inflammation in α-mangostin-treated and apigenin-treated BT474 cells. The data was supported by programmed cell death analysis, where the treated cells mainly died by necrosis, which is typically linked with inflammation. However, both compounds induced a fast response from the cells and arrested cell-cycle of BT474 cells at the G1-phase. As known, apoptosis is a caspase-dependent process that is important in preventing metastasis and cancer progression. CASP3, CASP8 and CASP9 are typically assayed in apoptosis studies since they are situated at pivotal junctions in the apoptosis pathways. Both caspases subsequently activate caspase-3, which goes on to induce apoptosis in the cell. Furthermore, caspase-7 and -8 can cause inflammation in a host,,. Although necrosis was the main cause of BT474 cell death after treatment with α-mangostin or apigenin, the expression of CASP8 transcripts was significantly up-regulated by both compounds in these cells, which implies that apoptosis was still directly involved with caspase expression via the extrinsic pathway. The expression of BCL2 tended to be numerically decreased by both α-mangostin and apigenin, but this was not significant. Nevertheless, the numerical reduction in the BCL2 expression level is consistent with cell death by apoptosis,. Increased Cox2 and NF κ B transcript levels induced by doxorubicin were not found in BT474 cells, and so doxorubicin induced an antiproliferative activity without any anti-inflammation activity, and the cytotoxicity was mediated by apoptosis. The morphology of doxorubicin-treated BT474 cells was not changed much compared to the control cells, which also coincided with the numerically decreased expression level of BCL2 (albeit not significant), an apoptosis-associated gene. However, the transcript expression levels of CASP3, CASP7, CASP8 and CASP9 were all not significantly changed, and so the apoptosis induced by doxorubicin in BT474 cells involved other pathways and not via these caspases. Hence, the cell stress or the condition of mitochondria should be further investigated. The proto-oncogene (CTNNB1) numerically tended to be down-regulated by all three compounds in BT474 cells, which may lead to the cell growth inhibition and apoptosis induction, although this decrease was not significant. Considering the morphology of treated BT474 cells, a lot of vacuoles were observed following α-mangsotin and apigenin treatment, which may show that the treated cells died by other alternative ways in addition to necrosis and apoptosis. Autophagy is one possibility, because it is the mechanism that disassembles dysfunctional components to recover nutrients from aged or damaged cytoplasm and organelles. This recycling method results in the formation of phagocytosis vacuoles. For this reason, it is desirable to find new compounds that induce the death of cancer cells by different or multiple ways. For example, Zou et al. reported that harmine inhibited B16-F-10 melanoma cells via autophagy and apoptosis. In this study, α-mangostin significantly upregulated CathepsinB transcript levels in BT474 cells, and so it is possible that the α-mangostin-induced cytotoxicity involves autophagy as well. This work was financially supported by Chulalongkorn University, the Doctoral Degree Chulalongkorn University 100th Year Birthday Anniversary, the 90th Anniversary of Chulalongkorn University Fund (Ratchadaphiseksomphot Endowment Fund), Sci-Super IV_61_003 and the Overseas Research Experience Scholarship for Graduate Student. Li Y, Liu C, Tang K, Chen Y, Tian K, Feng Z, et al. Novel multi-kinase inhibitor, T03 inhibits Taxol-resistant breast cancer. Mol Med Rep 2018; 17(2): 2373-2388. Lu J, Tan M, Huang WC, Li P, Guo H, Tseng LM, et al. Mitotic deregulation by survin in ErbB2 overexpressing breast cancer cells contributes to Taxol resistance. Clin Cancer Res 2009; 15(4): 1326-1334. O’Reilly EA, Gubbins Ь, Sharma S, Tully R, Guang MΗ, Weiner-Gorzel K, et al. The fate of chemoresistance in triple negative breast cancer (TNBC). BBA Clin 2015; 3: 257-275. Stamon DJ, Leyland-Jones B, Shak S, Fuchs H, Paton V, Bajamonde A, et al. Use of chemotherapy plus a monoclonal antibody against HER2 for metastatic breast cancer that overexpresses HER2. N Engl J Med 2001; 344(11): 783-792. Wu J, Meng L, Long M, Ruan Y, Li X, Huang Y, et al. Inhibition of breast cancer cell growth by the Pteris semipinnata extract ent-11 α-hydroxy-15-oxo-kaur-16-en-19-oic-acid. Oncol Lett 2017; 14(6): 6809-6814. Sayeed MA, Bracci M, Ciarapica V, Malavolta M, Provinciali M, Pieragostini E, et al. 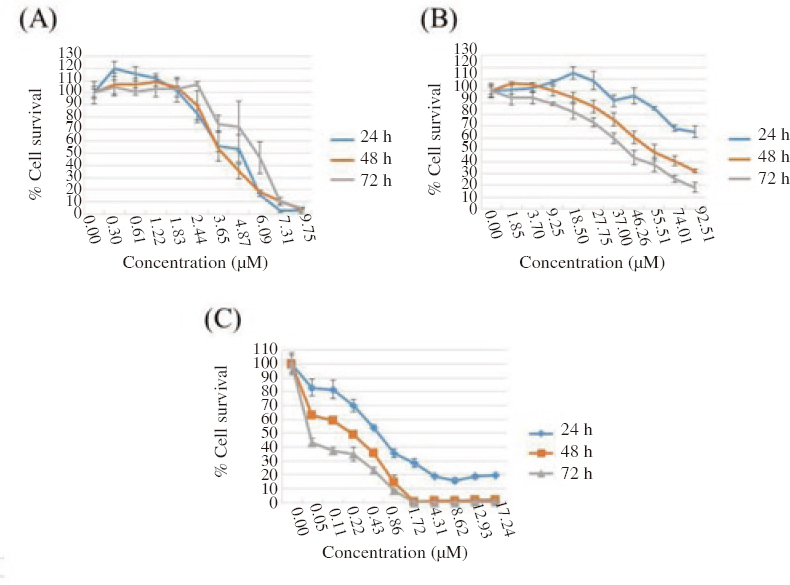 Allyl isothiocyanate exhibits no anticancer activity in MDA MB-231 breast cancer cells. Int J Mol Sci 2018; 19(1). Doi: 10.3390/ijms19010145. Ali R, Samman N, Al Zahrani H, Nehdi A, Rahman S, Khan AL, et al. Isolation and charactierization of a new naturally immortalized human breast carcinoma cell line, KAIMRC1. BMC Cancer 2017; 17(1): 803. Mason JK, Thompson LU. Flaxseed and its lignan and oil components: Can they play a role in reducing the risk of and improving the treatment of breast cancer? Appl Physiol Nutr Metab 2014; 39(6): 663-678. Ezzat SM, Shouman SA, Elkhoely A, Attia YM, Elsesy MS, El Senousy AS, et al. Anticancer potentiality of lignin rich fraction of six Flaxseed cultivars. Sci Rep 2018; 8(1): 544. Makki J. Diversity of breast carcinoma: Histological subtypes and clinical relevance. Clin Med Insights Pathol 2015; 8: 23-31. Zhang KJ, Gu QL, Yang K, Ming XJ, Wang JX. Anticarcinogenic effects of α-mangostin: A review. Planta Med 2017; 83(03/04): 188-202. Nugitrangson P, Puthong S, Iempridee T, Pimtong W, Pornpakakul S, Chanchao C, et al. In vitro and in vivo characterization of the anticancer activity of Thai stingless bee (Tetragonula laeviceps) cerumen. Exp Biol Med 2016; 241(2): 166-176. Kowalczyk A, Bodalska A, Miranowicz M, Karlowicz-Bodalska K. Insight into novel anticancer applications for apigenin. Adv Clin Exp Med 2017; 26(7): 1143-1146. Chantarudee A, Phuwapraisirisan P, Kimura K, Okuyama M, Mori H, Kimura A, et al. Chemical constituents and free radical scavenging activity of corn pollen collected from Apis mellifera hives compared to floral corn pollen at Nan, Thailand. BMC Complement Altern Med 2012; 12: 45. Ko KP. Isoflavones: Chemistry, analysis, functions and effects on health and cancer. Asian Pac J Cancer Prev 2014; 15(17): 7001-7010. Grivennikov SI, Greten FR, Karin M. Immunity, inflammation and cancer. Cell 2010; 140(6): 883-899. Sano Y, Kogashiwa Y, Araki R, Enoki Y, Ikeda T, Yoda T, et al. Correlation of inflammatory markers, survival and COX2 expression in oral cancer and implications for prognosis. Otolaryngol Head Neck Surg 2018; 158(4): 667-676. 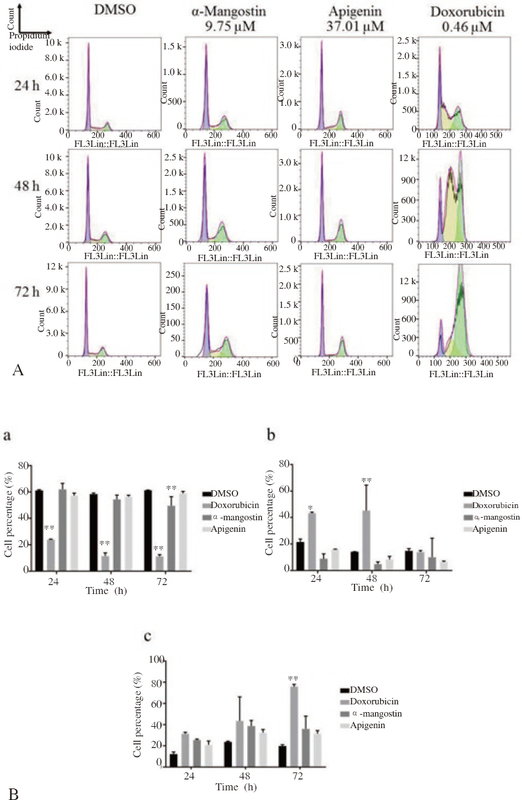 Perego S, Sansoni V, Banfi G, Lombardi G. Sodium butyrate has anti-proliferative, pro-differentiating and immunomodulatory effects in osteosarcoma cells and counteracts the TNF α-induced low-grade inflammation. Int J Immunopathol Pharmacol 2018; 32: 394632017752240. Casili G, Campolo M, Paterniti I, Lanza M, Filippone A, Cuzzocrea S, et al. Dimethyl fumarate attenuates neuroinflammation and neurobehavioral deficits induced by experimental traumatic brain injury. J Neurotrauma 2018; 35(13): 1437-1451. Mehlen P, Puisieux A. Metastasis: A question of life or death. Nat Rev Cancer 2006; 6(6): 449-458. Chang CM, Wang ML, Lu KH, Yang YP, Juang CM, Wang PH, et al. Integrating the dysregulated inflammasome-based molecular functionome in the malignant transformation of endometriosis-associated ovarian carcinoma. Oncotarget 2017; 9(3): 3704-3726. Latz E, Xiao TS, Stutz A. Activation and regulation of the inflammasomes. Nat Rev Immunol 2013; 13(6): 397-411. Man SM, Kanneganti TD. Regulation of inflammasome activation. Immunol Rev 2015; 265(1): 6-21. Hsu YN, Shyu HW, Hu TW, Yeh JP, Lin YW, Lee LY, et al. Anti-proliferative activity of biochanin A in human osteosarcoma cells via mitochondrial-involved apoptosis. Food Chem Toxicol 2018; 112: 194-204. Barreiro-Iglesias A, Sobrido-Cameán D, Shifman MI. Retrograde activation of the extrinsic apoptotic pathway in spinal-projecting neurons after a complete spinal cord injury in lampreys. Biomed Res Int 2017; 2017: 5953674. Papini A. Investigation of morphological features of autophagy during plant programmed cell death. Methods Mol Biol 2018; 1743: 9-19. Zou N, Wei Y, Li F, Yang Y, Cheng X, Wang C, et al. The inhibitory effects of compound Muniziqi granule against B16 cells and harmine induced autophagy and apoptosis by inhibiting Akt/mTOR pathway. BMC Complement Altern Med 2017; 17(1): 517.